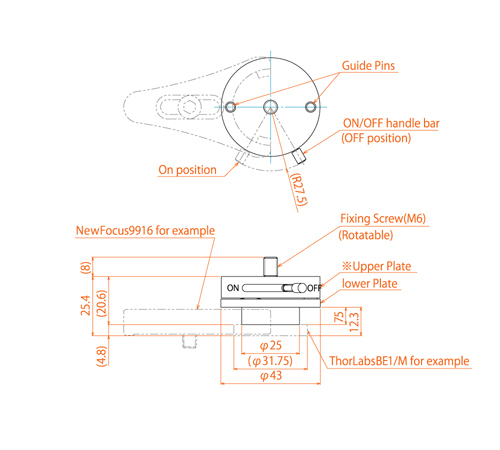 If you set the height of optics center in 2 inches by using Thorlabs BE1/M, the room for inserting a holding fork is about 7.5 mm. Please select a thin holding fork which is available from New focus, New Port and Sigma for example. The upper plate is collaboration with Thorlabs Japan and customized SB1T/M. 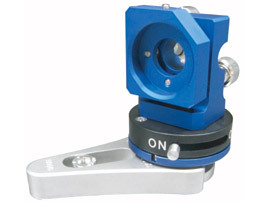 FBP1000S is a removable base mount with high reproducibility. We demonstrate the reproducibility and the stability of alignment by using a Mach-Zehnder interferometer where one of the mirrors is mounted on the FBP1000S with MM1000S as shown in picture. 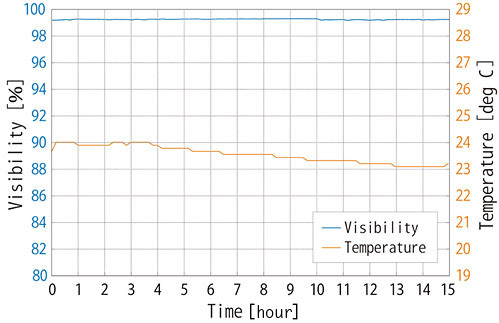 The upper test data shows the repeatability of visibility while the upper plate of FBP1000S was put on and off for several times. The lower data shows the long term stability of alignment. FBP1000S will be shipped with an inspection data. The upper plate can be replaced with another one with high repeatability. 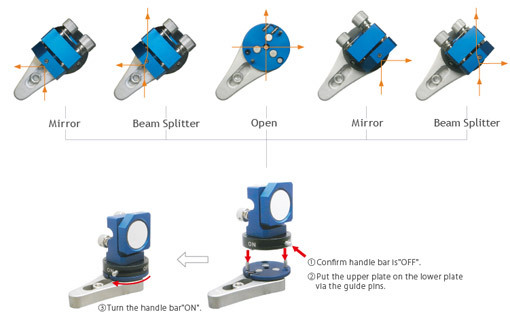 So, if you need several components on the upper plates, mirror, beam splitters and so forth, you can easily switch other optics as below. Before you put the upper plate on the base, please make sure that the handle bar is set at the "OFF" position. If at "OFF" position, the contact point of the base might be damaged by magnetic force. *Our product specifications may change on occasion without notice. Copyright(c) 2007 First Mechanical Design Corporation. All Right reserved.